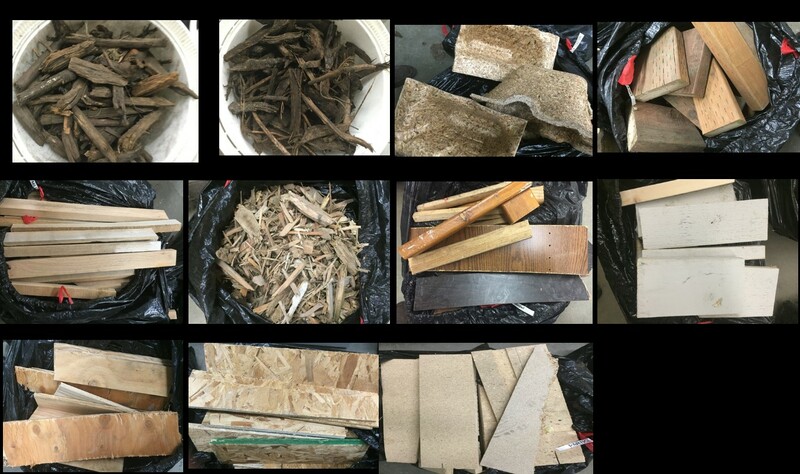 Wood-based products in municipal solid waste are extremely varied and include materials such as plywood, particle board, and furniture (Figure 1). They also include wood that has been painted or treated, which has the potential to introduce environmental pollutants that can have detrimental effects on crops and soils. Michael Ayiania, a Ph.D. student working with Dr. Manuel Garcia-Pérez in the Department of Biological Systems Engineering, has worked to characterize biochar produced from urban wood waste and compost overs and to examine potential pollutants—heavy metals, polycyclic aromatic hydrocarbons, and volatile organic compounds—in biochar produced from these municipal sources. Biochar is made through a process called pyrolysis, which is a thermal conversion in the absence of oxygen. 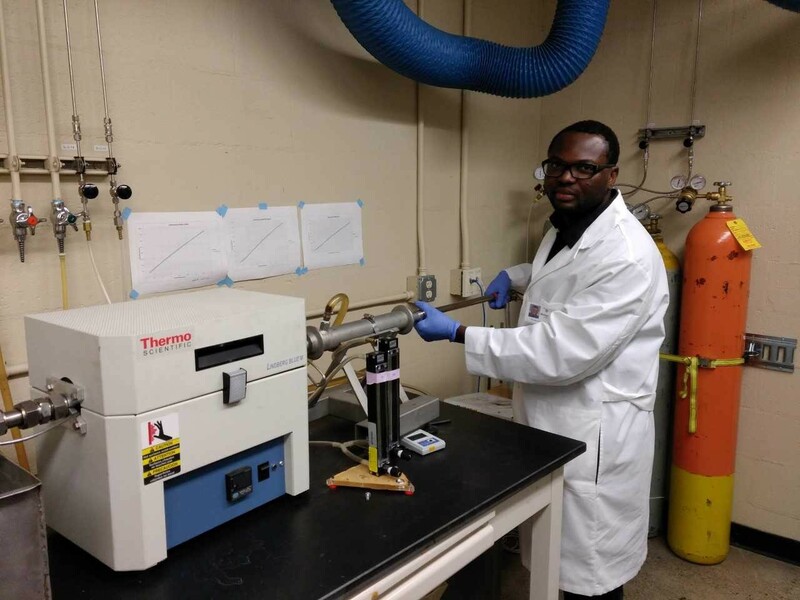 For this project, Ayiania prepared samples by grinding and sieving them, and then used a machine called a spoon pyrolysis reactor (Figure 2), set at either 400°C or 600°C, to create small batches of biochar from each of the feedstocks (Figure 3). Ayiania investigated the fundamental characteristics of the resulting biochar that affect its usefulness as a soil amendment: fixed carbon and ash content, surface area, and micropore volume. Fixed carbon is the fraction of biochar that can persist in the soil for thousands of years. It is desirable for biochar used to amend soil to have a high fixed carbon content. A high ash content can also benefit cropland by raising the pH of acidic soils. Surface area impacts the reactivity of biochar; the greater the surface area, the more chemical interaction with the soil per gram of biochar. Micropores (Figure 4) contribute to the surface area of biochar and affect its ability to adsorb small molecules. For all feedstocks, the biochar with the best characteristics for use as a soil amendment (high fixed carbon and ash content, surface area and micropore volume) was obtained at 600°C. The presence of metals in soil amendments can be an issue because of their tendency to build up in soil with repeated applications. In this project, potentially problematic concentrations of metals were found in painted wood (mercury) and treated wood (arsenic). Ayiania also monitored soluble organic compounds (in this case, compounds called polycyclic aromatic hydrocarbons – carcinogenic compounds that can be produced during pyrolysis that have a detrimental effect on soil quality and plant growth), but none were found in biochar from any of the feedstocks. While treated and painted wood materials in this study were not suitable for use as biochar feedstocks due to metal concentrations in the resulting products, this study confirms that some wood-based fractions of municipal solid waste and compost overs can be suitable feedstocks for producing biochar as a soil amendment—waste to farm biochar—especially if produced at high temperatures. For more information on this project and others funded through the Waste to Fuels Partnership, please see the Waste to Fuels Technology Partnership 2015-2017 Biennium Report. Read more about research underway on the Garcia-Pérez lab’s website. This work was funded through the Waste to Fuels Technology Partnership between the Center for Sustaining Agriculture and Natural Resources at Washington State University and the Washington Department of Ecology’s Waste 2 Resources Program. This partnership advances targeted applied research and extension on emerging technologies for managing residual organic matter. Ayiania, M. and M. Garcia- Pérez. Quantification of Heavy Metals and Soluble Organic Pollutants in Biochar from Pyrolysis of Urban Wood Residuals and Compost Overs. Chapter 5 in Chen, S. et. al. Advancing Organics Management in Washington State: The Waste to Fuels Technology Partnership. Waste 2 Resources, Washington State Department of Ecology Publication No. 18-07-010. Olympia, Washington. Lehmann, J. 2007. A handful of carbon. Nature, 447 (7141), 143-144. Marris, E. 2006. Putting the carbon back: Black is the new green. Nature, 442 (7103), 624-626. 2 thoughts on "Turning Urban Wood Waste into Biochar"
I would like to contact the hiring director with my inquiry for clerical, administrative or research assistant positions of employment near or within city limits of Mercer Island,WA where I live. I am familiar with WSU’s extension field office in Renton and would commute to that location. Agriculture, Climate, Sustainable Practices, Community and Society, and Energy are all special topics of interest to me. Currently I have been employed as an Educator in local school districts in Washington State and Colorado. I look forward to a career change. All WSU positions are posted here: https://www.wsujobs.com/ Good luck!